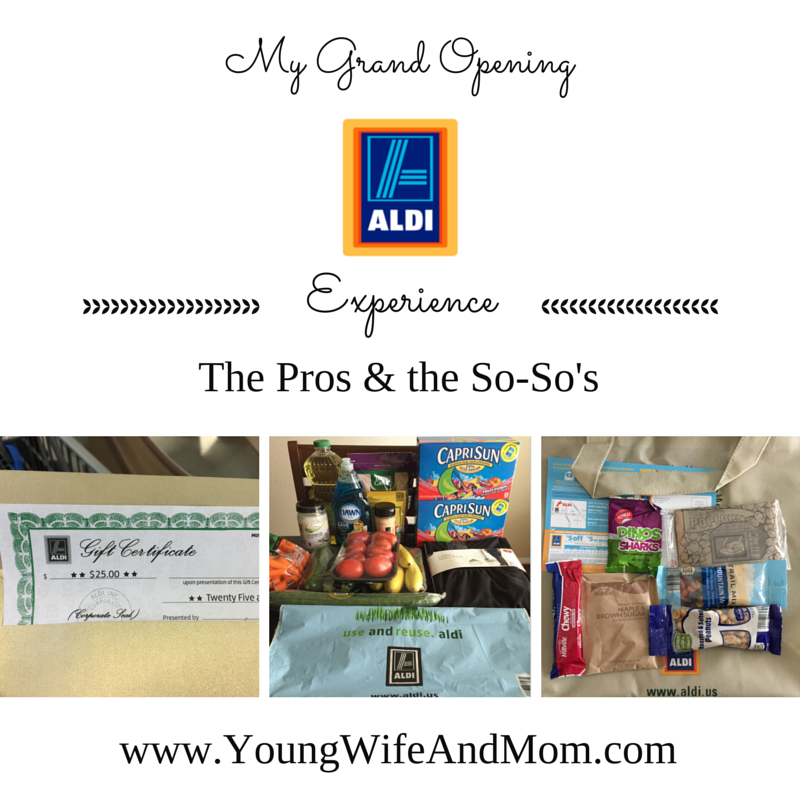 A new ALDI store opened about 15 minutes from us. I was so excited to see that there is finally one I could go to without a long drive. There are plenty in the city but not so many in the outer suburbs where we live. 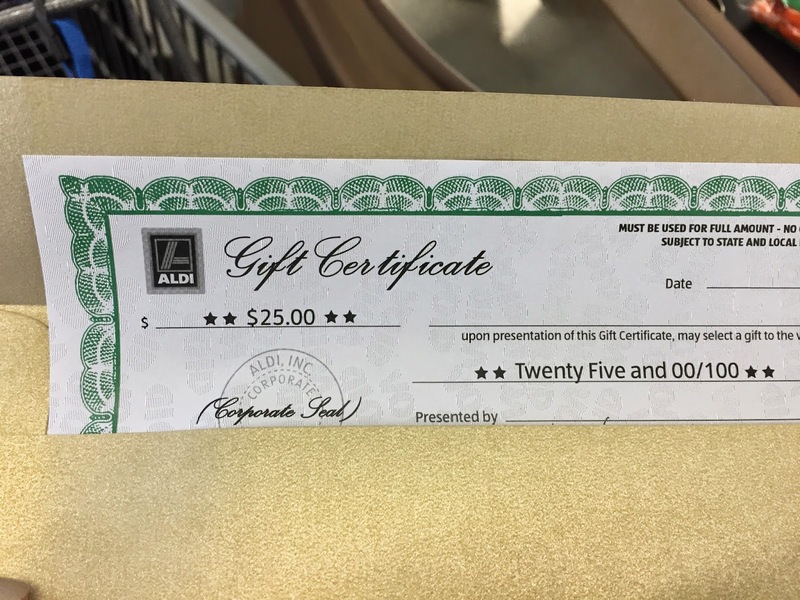 I've been to ALDI before with my mom quite a few years ago when I was in high school. She loved to shop there. We were on food stamps so it really made the budget stretch further. I'd been wanting to see if I could get some great deals like we used to. After I dropped off the little one at school, I headed over to the store. The store was opening at 9am and I arrived about 8:45am. The parking lot was full and the line was wrapping around the outside of the store. 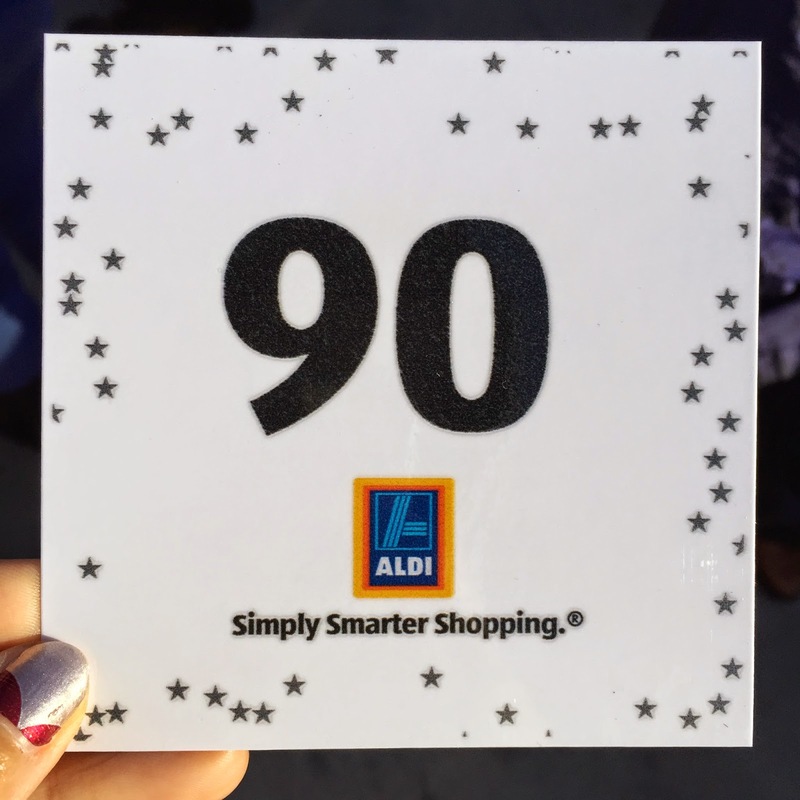 As luck would have it, I walked to the back of the line just as the lady who was giving out the numbers was passing by. #90, whew I made it just in time. The first 100 guests received a golden ticket with a chance to win $100. I wasn't too impressed when I initially read that on the mail flyer. But as we got closer to the lady giving them out, I saw that there were gift certificates inside the "golden tickets" (they were really golden envelopes.) The guy a couple of people in front of me received one worth $25!! I'd take that in a heartbeat. I handed over my #90 ticket and opened that golden envelope so fast. YAY! $25 for me PLUS the $5 off $25 coupon from the mail flyer. This is gonna be a good shopping trip. There was coffee, juice and danish samples outside plus a plethora of sample stations throughout the store. 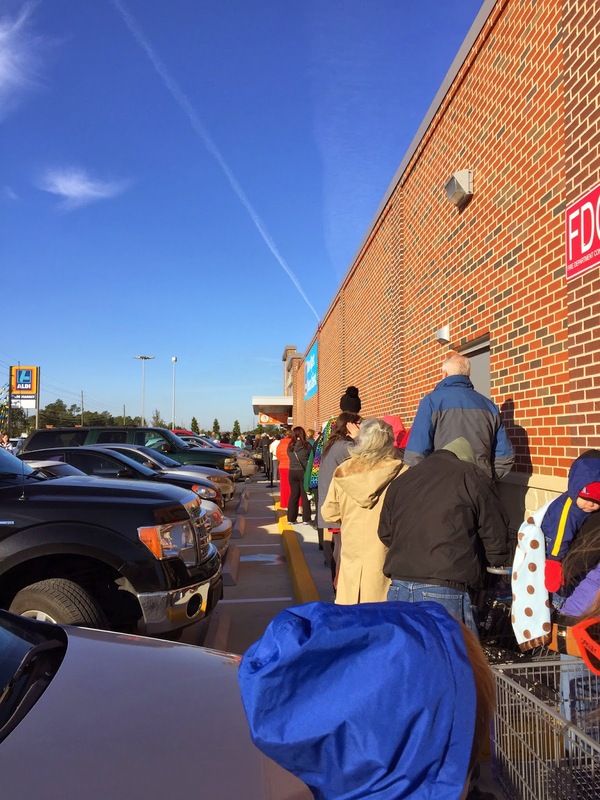 ALDI was packed full of people and large shopping carts in every aisle. It was almost like riding on a conveyor belt. Keep gliding down the aisle and toss in anything you can grab but don't hold up the line. I ended up with canola and coconut oils, croutons, bacon bits, spices, Capri Sun juices, a big bottle of Dawn, veggies and ladies workout pants. I put a few things back that I picked up during the rush around the store. My total was $33 before the $5 coupon and $25 gift certificate. I ended up paying only $3 out of pocket!! 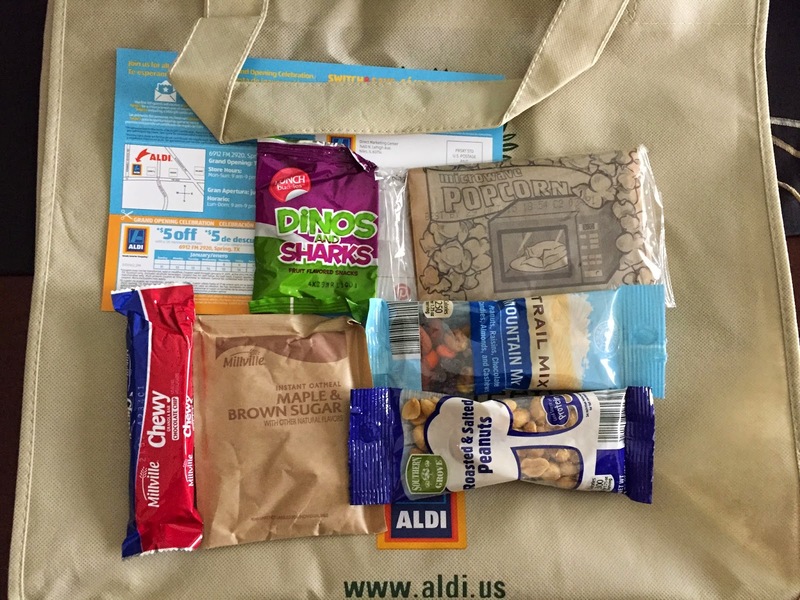 Plus, on the way out we received a free Reusable bag with product samples and another $5 off $25 coupon. $33 Retail, $3 out of pocket!! Many items cheaper than my favorite grocery store. Produce section: easy & cheap. Everything is packaged for convenience. No weighing necessary & priced pretty reasonably. Spices: Under $1 for Cumin! Aw man, I just paid $3 at my grocery store!! Not many name brands. Great if you are not brand loyal or don't use name brands at all. Kinda a downer if you were looking to save on your fave products. Not a one-stop shop - They don't carry everything that a grocer normally carries like pharmaceuticals, makeup, etc. Selection is small - You may only have two rice choices versus 10 at another store. Payment options - They don't accept credit cards or checks.I actually had to hold up the line to move some money around to accommodate this. It wasn't on the flyer or anywhere that I saw in the store. Overall, the samples were yummy. I wouldn't mind buying and trying some of the ALDI exclusive brands after tasting some. I will definitely go back for the produce, meat and dairy but not so much the shelf goods. My family prefers their brands and I get slack every time I try to slide something different in there. Remember, to bring you own bags and cash/debit card.I don't expect it to be so crowded like this on a regular day, but who knows. I'll see next time! 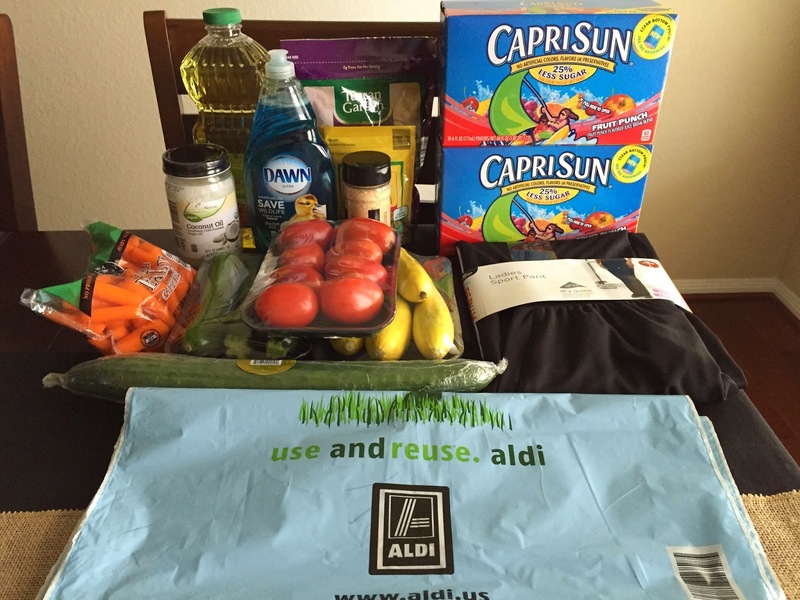 Are you an ALDI shopper? I'd love to hear your experience and tips!